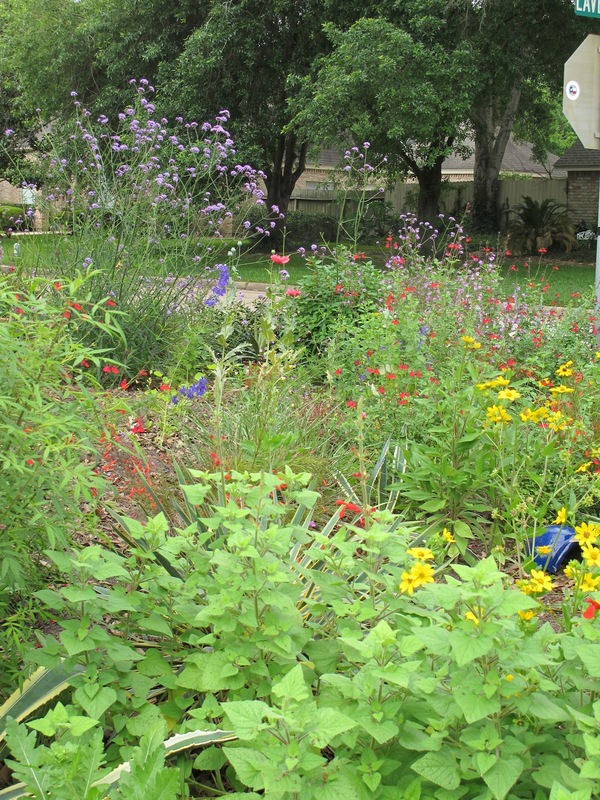 So it's Garden Bloggers' Bloom Day once again and I thought I'd do something a little different this month and post one picture for each bed/border/planting area here on my corner of Katy. While it won't give y'all a feel for the size of those beds, it might give you a better understanding of why I have so much trouble keeping up with it all! We'll begin out front on the southeast corner of the property. There's a small bed, about 6 feet long by 2 feet wide, just in front of the fence. 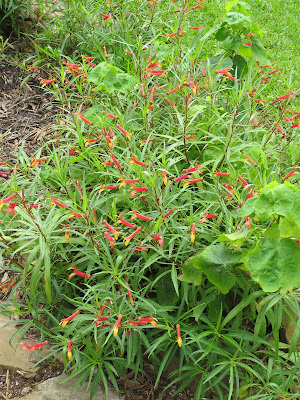 Mexican Lobelia, a/k/a Candy Corn Lobelia (Lobelia laxiflora) runs rampant in the bed ... and attempts to run out of it. 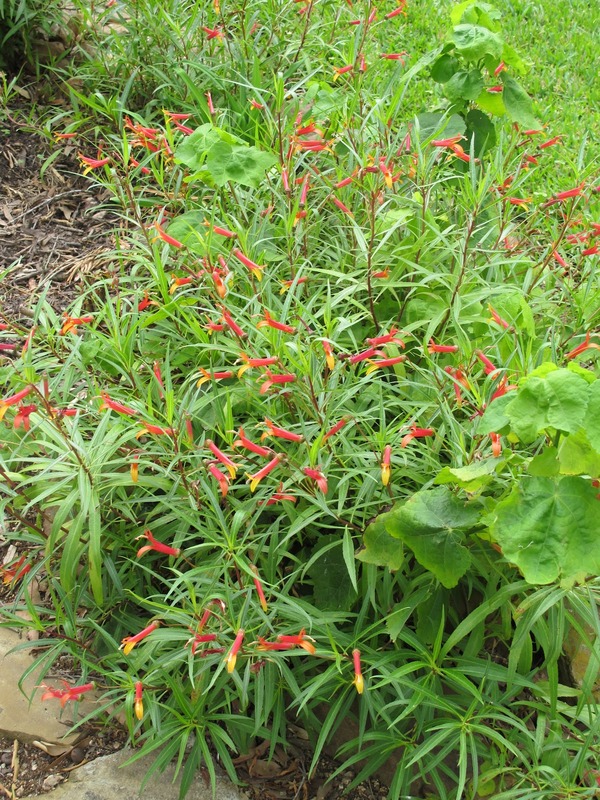 There's also yellow Butterfly Vine (Mascagna macroptera), Miniature Hamelia, native Turk's Cap, David Verity cuphea and a daylily in that space. There's also a long border that runs along the property line on the south side. 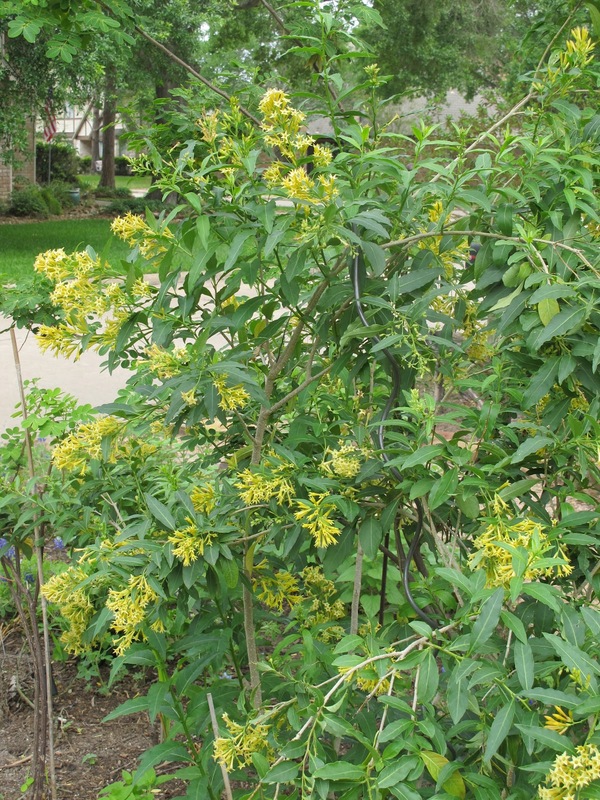 This Cestrum parqui, Hardy Willow-Leafed Jessamine, was purchased at Plant Delights Nursery in 2009 during the Garden Writers' Association tour. I just noticed that they call it a prolific seed producer but I haven't seen any seedlings around it. That border is also home to Cassia 'Buttercream', a river birch, bluebonnets, daylilies, agaves, yuccas, snake herb, rudbeckias, anisacanthus, bauhinia, hamelia, thryallis, turk's caps, salvia, iris and evolvulus (maybe more ???). A willow oak tree grows on the south side of the house and right now the columbines are putting on their annual spring show. I suspect there's been some cross-pollination going on amongst the Hinckley's yellow columbines and the native red and yellow Aquilegia canadensis because there are so many variations amongst the A. canadensis. This bed spans the width of the south side of the house. There's a path between it and the long border. Also planted in this bed (for now) are various bulbs - Narcissus, allium, small amaryllis -, a 'Marilyn's Choice' abutilon that was damaged by a falling limb, native ranunculus, golden crinum, Cuphea macropetala, crocosmia/montbretia, a Texas Buckeye, castor bean, more anisacanthus and Mexican lobelia, Dicliptera suberecta, Thryallis, turk's caps, pineland meadows hibiscus, turnera, rudbeckia, and daylilies (maybe more ???). There's a path just behind this bed and then another bed runs along the front wall of the house. 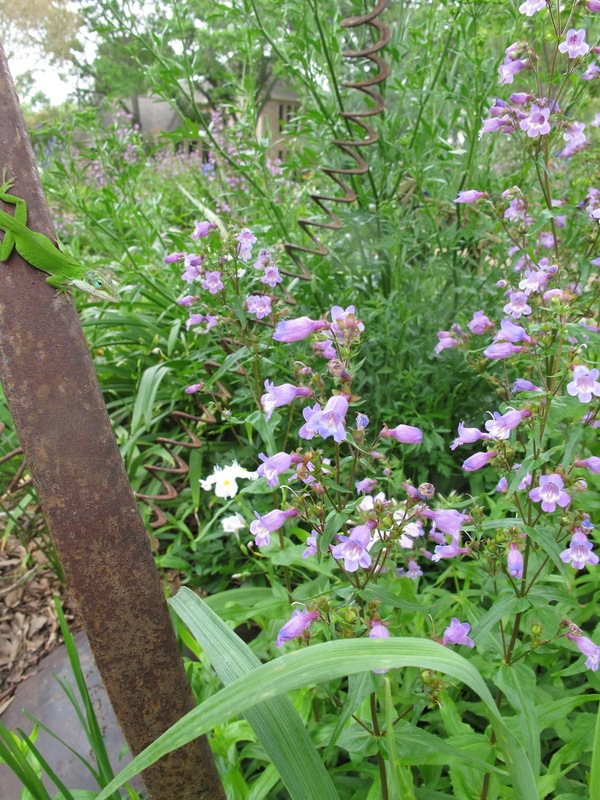 The Japanese Blueberry pictured above is planted in that bed along with more columbines, cardamom ginger, Farfugiums/Ligularias, thryallis, Paco's Possumhaw holly, hamelias, Freesia laxa, crocosmia/montbretia, turk's caps, Salvia madrensis (definitely more that I can't remember). Here are two of the mixed parentage columbines. 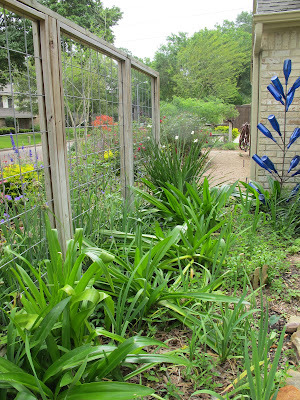 The willow oak bed is edged by a low moss rock wall, in front of which is a bed containing more daylilies, rudbeckia, Louisiana iris, hamelias, thryallis, agave, yucca, dyckia, sedums, Mexican lobelia, Salvia greggii, Freesia laxa, crocosmia and more, including spiderwort as seen below with screaming yellow sedum blooms. In the interests of time, yours and mine, I believe I have to stop listing all the plants that are in each bed ... why did the Head Gardener not counsel me to be more judicious in y plantings???? Ignore the derisive laughter you hear. Along the sidewalk on either side, there are rock garden and gravel planting areas for sedums, succulents and other such xeric plants. My current favorite is this Euphorbia 'Tiny Tim'. Take a deep breath, maybe get yourself something to drink or a snack. We're not even halfway through! On the north side of the property, there's one humongous bed surrounding the water oak. It's a bed with a split personality since the tree bisects it ... the area in front of the courtyard wall is what was making me so morose earlier this year. I won't say I've gotten a handle on it yet but I'm moving in that direction. There's a dwarf ornamental pomegranate blooming on the southerly side. The blooms almost look like they're made of wax ... aren't they just the coolest? On the northern side of that bed, there's a woodland garden of sorts since the oak provides afternoon shade. Pink Indigofera is about all that's blooming now in that area. A path runs in front of the water oak bed from the north corner of the house to the front walkway. There's a curbside bed in front of that path with a dry stream bed bordering it one side and the sidewalk on another. 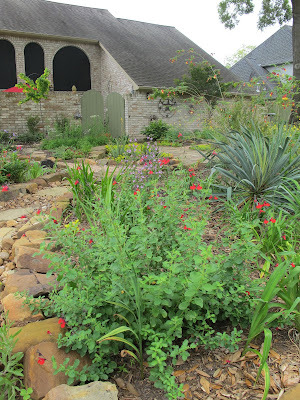 Here's a partial view of that bed with Salvia 'Cherry Chief' adding a pop of red. 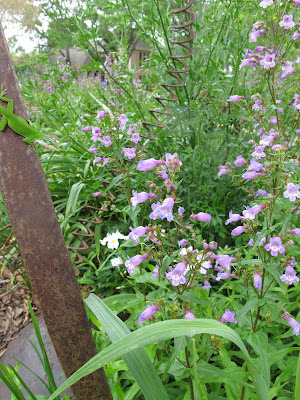 On the other side of the dry stream is the 'Love Your Mother' bed, named for the A. L. Roche' sculpture. 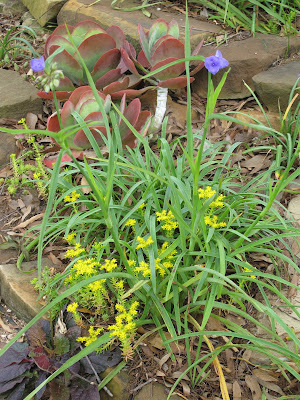 Gulf Coast Penstemon, Practically Perfect Pink Phlox (as named by Gail of Clay & Limestone) and Iris cristata are blooming all around the world. I didn't see the little friend posing on the sculpture until I uploaded the picture! Let's see, we're at 10 beds/borders and counting. At the risk of sounding like an infomercial, but wait, there are more! Next up, what was envisioned as a patchwork quilt bed is planted in front of the Love Your Mother bed. The patches are mighty irregular and some tweaking will probably be necessary soon. I still like it better than the solid cover of wedelia that was originally planted there when we redid the front in 2010. 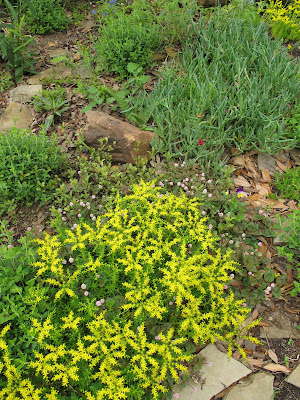 Mexican Sedum and Polygonum 'Pink Buttons' don't really complement each other, as you can see from the picture. That Polygonum is one prolific self-seeder and creeper ... don't turn your back on it! The corner bed is next up. Here's a partial view of the bed as you look to the west. 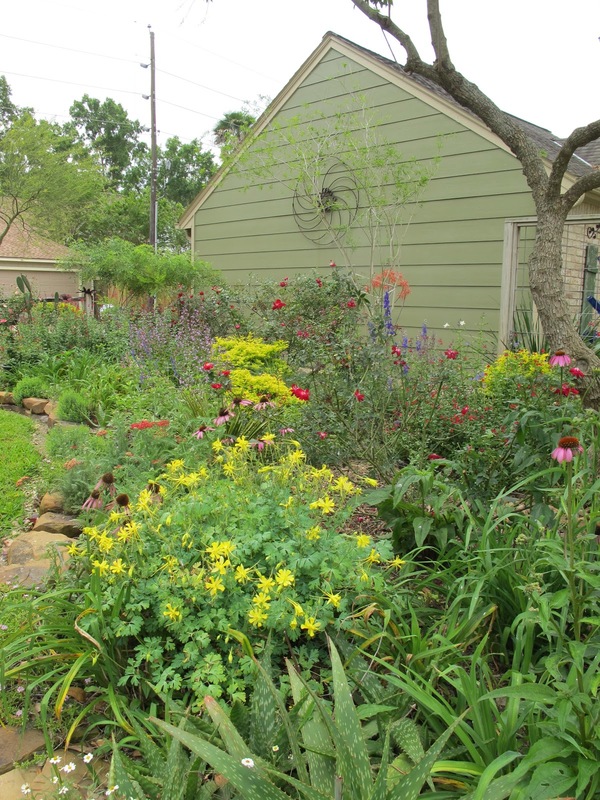 This bed wraps around the curb and is home to agaves, yuccas, daylilies, ornamental grasses, Cherry Bomb hollies, Texas Sage and a host of perennials and annuals. Crazy. There's a half-circle bed on the north facing side of the house, where the pine tree resided before its recent dismemberment. The Texas Olive (Cordia bossieri) in that bed has just begun to bloom. There's a bed along the east trellis planted with hymenocallis, Louisiana iris, night-blooming Cestrum, Australian violet, spiderwort, an annoyingly aggressive native ruellia and the Orange Drop dietes-type iris you see at the far end. The penultimate front/side garden bed runs the length of the garage wall and then on around the vitex tree that's so stunning when it blooms. That's Hinckley's columbine blooming in the foreground. Coneflowers, spiderwort, giant aloes, Chi Long Han Zhu roses, Cherry Chief salvias and Gulf Coast pestemon also make appearances in this bed. I'm going to save the back garden beds and borders for another post so this will be my final picture. The rose bed is bisected by a split rail fence built by my friend and neighbor Woody with minimal assistance from the Head Gardener. Antique and old garden roses share space with various perennials and annuals, a 'Desert Museum' Retama, ornamental grasses and assorted bulbs. Garden Bloggers' Bloom Day is hosted by the inimitable Indy gardener, Carol of May Dreams Gardens. 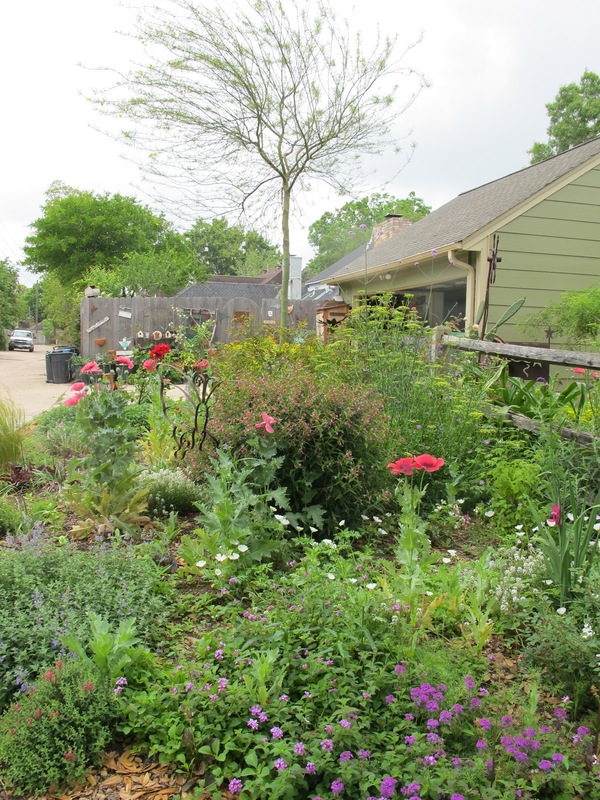 Check out her Bloom Day post to see what's blooming in other gardens around the world! Very nice! We just bought a Texas olive, will be awhile before it blooms. My columbines are also blooming....cannot wait until my garden is as mature as yours! Yes, indeed, quite a lot of beds and borders! It is looking just wonderful there...lovely and lush. I will look forward to the back garden tour. WOW AND DOUBLE WOW!!!! Your beds are so WONDERFUL!!! You have so many of the plants that I just love. I can't even name all the plants I thought were fabulous because there are so many. Do do such a great job!! Whoa, Cindy, and I mean that every which way! That is enough to keep many Head Gardeners busy. Happy every-day-is-blooms-day day! Such a variety of wonderful blooms you have. I just bought some columbines on my trip to ARE on Monday. I hope they will be as lovely as yours. I don't even recognize most of the names of your plants--but I do recognize columbine, and I love that big swath of yellow blooming aquilegias that you've got there. Always nice to see what you have going. I love the blooms up near the stop sign right now. BTW: How did you get that green anole to pose in one of those photos? Holy Cow, Cindy! This was quite an accounting. Lots and lots of plants completely unknown to me, I love it. Your garden sounds enormous, I had no idea. How on earth do you keep up? I want to increase my beds, but I'm not sure if that will overextend me. "WOW AND DOUBLE WOW!!!! Your beds are so WONDERFUL!!!" Wow. Your neighbors must love strolling by your property.